PASGR offers a suite of high level professional development courses for active and committed researchers and policy actors. The courses are designed to be adaptable for different research and policy audiences. They are especially effective when we bring together participants from different countries, organizations and disciplinary backgrounds. Courses are developed and delivered through partnerships between scholars from non-African institutions (including the UK’s Institute of Development Studies (IDS) at the University of Sussex) and an array of highly motivated, creative and excellent African scholars who undergo a training of trainers programme. Course modules are frequently reviewed and redesigned for currency and relevance using lessons and experiences obtained in the course of previous training. This training offers post-graduate students, doctoral candidates and early to mid-career social science researchers and faculty a substantial opportunity to update and upgrade their skills in social science research methods. 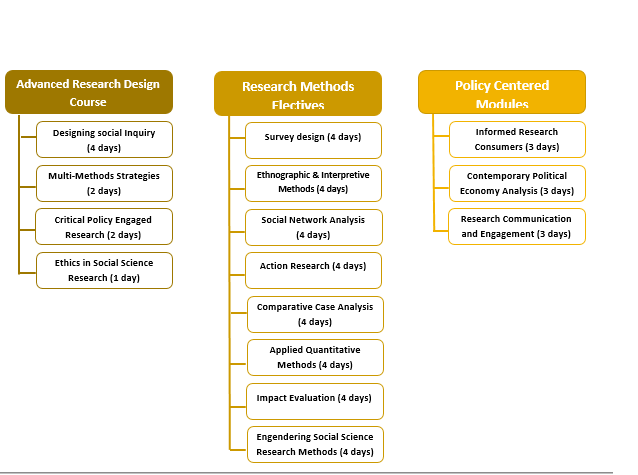 Participants are walked through each phase and dimension of designing rigorous social science research. It consists of a suite of ten modules that are designed to provide alternative and innovative approaches to engaging with a research problem. The first three modules are foundational and introduce the theoretical and practical issues involved in the design and successful execution of a policy-engaged research project. The remaining modules are based on the theoretical and practical aspects of methods of data collection using both quantitative and qualitative tools and are offered as electives to complement the core modules. The module’s first goal is to develop participants’ critical engagement with the existing state of knowledge in their respective fields. It equips participants with the competencies to question conventional definitions of the problem, the categories or techniques used for its analysis, and possible interpretations. It also helps participants to turn ideas or assumptions into researchable questions. This module introduces participants to advances in concept formation and illustrates how concepts can be modified, redefined, or created to accurately capture the empirical events, actors, or processes being investigated. There is a growing interest in mixed method research among social scientists due to its relevance for policy-oriented research. The practice of mixing methods has emerged as a suitable complement to the dominant quantitative and qualitative paradigms. This module provides insights into the mixed method approach and its utility for policy engaged research. It examines the basic assumptions of the mixed method tradition and its fundamental principles. Researchers engaged in policy-related work stand to benefit if they interest policy actors in the work they are doing, involve them in the various stages of their research project, and get their feedback to enrich the research design. This module aims to enhance researchers’ capacity to strengthen their relationship with policy actors in order to improve their research design and the chances that their findings will be used to engage policy. The module helps participants develop knowledge and skills related to building relationships with various policy actors and decision makers. It refines participants’ ability to communicate research ideas and findings. It equips them with skills to distil the key message(s) they would like to communicate to relevant policy actors. Surveys produce rather than collect data. Designing an effective survey, one that captures what one is after, is an art. Moving from general hypotheses and research questions to specific and measurable concepts, and then to simple questions which respondents can understand and answer, is far from straightforward. There are many decision points. There are also trade-offs in how we measure concepts, the response categories we choose, sampling strategies, and even how interviews are conducted. All of these components influence the kind of data a survey produces. This module equips participants with knowledge and skills to design and execute effective surveys. This module looks at different comparative case study designs and the types of causal claims and interpretive analysis they allow. It discusses how to define “a case” and locate it within broader phenomena. The module also explores how case study research contributes to theory development and concept formation. It further discusses how to address validity, selection bias and the representativeness of cases in small-N case study analysis. Interpretive social science rests on the idea that unlike the world of physical objects, the social world is made up of thinking and feeling beings engaging in meaningful action. To understand the social world, then, we must grasp the point of view of the actors who inhabit it and the context in which they do. Interpretive methods, used by various branches of the humanities and social sciences, frequently play a role in concept and theory generation, and can be used in conjunction with comparative case studies, action research, and network analysis. They can also be used, at various stages of a research project, to inform or complement quantitative methods. Interpretive methods are particularly central to anthropology and ethnography, on which we focus here. In particular, this module provides training in two of ethnography’s core techniques: participant observation and semi-structured interviewing. Participants will also practice coding and analysing the data generated by these techniques. Through a combination of presentations, applied learning (practical experience), group work and feedback, participants develop an appreciation for the different ways in which interpretive social inquiry and the key methods mentioned above can contribute to policy-oriented research. Any research problem where relationships are important may benefit from social network analysis. Social network analysis is an analytical approach that allows researchers to analyse patterns of relationships among a set of actors. The actors are usually people, but they can also be organisations, cities, websites, nations, etc. Social network analysis can be applied to substantive problems that cut across many subjects and disciplines. In this course, participants are introduced to the theoretical foundations and research methods used in social network analysis. The module also explores the usefulness of social network analysis for the study of governance and public policy. This module introduces basic statistics and econometric techniques, underlining the appropriate techniques that can be considered for analysis depending on the type of data available. It further explores the idea and intuition behind randomisation and why it is important in establishing causality. Practical examples are given for understanding the concept of randomisation and why it can lead to erroneous results if it is not taken into account. The difference between correlation and causality is illustrated using different designs that establish causality, such as randomised control trials (RCTs). It also distinguishes between inferences based on design vis-à-vis those based on econometric techniques. Action research brings multiple stakeholders into the process of research and data analysis that makes the process of meaning making more robust. It allows theories of change to be tested through the action of stakeholders. By engaging multiple actors in a process, wider ownership is achieved making sustainable outcomes more likely. Action research is gaining increasing recognition amongst practitioners and policy makers as it allows evidence to be generated through the process of executing projects and policies. An important advantage of action research is that, as a deliberative and iterative process, it allows flexible responses to complex situations that are constantly evolving. Many traditional research tools build static pictures of situations which are assumed for research purposes to be relatively static. This module explores a variety of methods ranging from co-operative inquiry to participatory action research and systemic action research. Case studies from a variety of African contexts such as water; HIV; Climate Change Adaption; etc are used. This module teaches elements of impact evaluation methods of welfare programmes in developing countries. It is designed for an audience of social scientists and is presented at a low-medium level of technical difficulty. The focus of the course is on the design of a rigorous impact evaluation rather than on statistical or econometric analysis. The module is not only designed for researchers interested in conducting impact evaluations, but also for those interested in overseeing, commissioning or studying impact evaluations conducted by other researchers. Apart from these modules, PDT continuously develops new training modules that are both relevant and result from demand. Currently PASGR is developing modules on Gendering Social Science Methods, and Basics of Digital Learning and Teaching. Participants are competitively selected and come from all corners of the African continent. The courses provide blended high quality short-term training, comprising initial pre-contact online interactions, face-to-face sessions and post-contact online follow up. Cohort sizes are limited to 20-25 participants for effective learning and interaction. The training follows an alternative pedagogy that uses interactive learner-centred techniques such as group projects, role plays, fieldwork and guided discussions coupled with peer learning. Premium is placed on technology enhanced learning that involves use of an online learning platform and a variety of multi-media materials i.e. electronic case studies, documentaries and animations, to support teaching and learning. It focuses on a practical and applied methods approach. For the research-centred training, participants come with an identified research problem that they then engage with using the new methods or techniques being taught. Participation emphasizes small group learning that includes review and support from the instructors and peers. The goal is to have each participant leave the course with a coherent and clear research project which can provide the basis for a PhD application, doctoral proposal development and field work, as well as a research funding proposal. It brings a policy focus that is meant to provide a stronger evidence base for current public policy—an element that is often lacking in most PhD programmes and short-course trainings offered in the region. To be informed of similar and other opportunities, register on the mailing list at http://www.pasgr.org/newsletters/ or connect via social media: Facebook, Google+, and Twitter.